London Underground is the biggest user of Service Vehicles, and their main base is at the central works at Acton. Most of the largest vehicles are kept in a yard beside the railway line between Acton Town and Chiswick Park. Although not ideal for photography, a trip past will usually reveal something of interest. 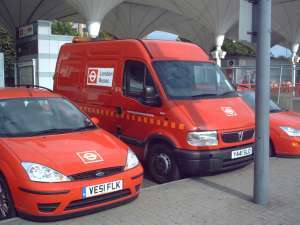 Smaller vehicles can often be seen nearby, and at several of the other main underground depots, although they are usually tantalisingly remote from publicly accessible areas. London Underground has other premises including crew rooms, offices and of course railway stations. These will sometimes yield one or two vehicles. An exception is Griffith House beside Edgware Road station. If the building doors and yard gates are open, a good number of vehicles can be seen here. Most of my observations of London Underground vehicles have been "out and about", on the road to wherever. This is particularly true late at night when a lot of the maintenance work is done on the system. London Buses related vehicles are a lot easier to track down. Most of these are attached to particular bus stations, with Stratford having the most as shown on the photographs page. Others include Victoria, Liverpool Street, Aldgate, London Bridge, Edgware, Harrow, Uxbridge, Kingston, Morden, West Croydon and Lewisham. Bus company vehicles are usually kept in bus gargages and can only be seen when in transit or attending breakdowns. Exceptions to this are the Metroline bus maintenance van which is often stationed at Marble Arch for rapid response, and crew cars operated by Metroline and London United, which can be seen at route terminals such as Golders Green, Paddington and Hatton Cross. Garage open days provide probably the best opportunity to see company-owned vehicles, and may also be attended by some of the preserved examples. Dates of any forthcoming open days will be posted on the news page.